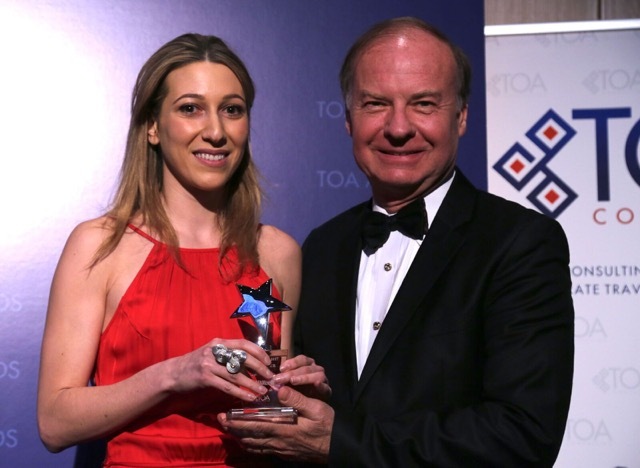 TCA President G. Lincoln McCurdy presenting Ceylan Ecer with TURKOFAMERICA Magazine's top '40 under 40' award. On Thursday, March 16th, TCA President G. Lincoln McCurdy attended Turkish Philanthropy Funds’ (TPF) 10th Anniversary Reception and Dinner in New York. TPF presented its first ever ‘Philanthropist of the Year Award’ to the eminent Turkish industrialist and businessman Rahmi Koc. On Friday, March 17th, TCA President G. Lincoln McCurdy attended the awards ceremony in New York for TURKOFAMERICA Magazine’s top '40 under 40' most influential Turkish Americans in the U.S. At the awards ceremony, McCurdy had the honor of presenting an award to Ceylan Ecer, an art advisor and dealer in Brooklyn. Ecer was one of the first participants in TCA’s Washington Summer Internship Program on Capitol Hill in 2007. In recent years, she has purchased artwork for names such as Leonardo di Caprio, baseball player Alexander Rodriguez, and Monica Bellucci. On March 16 and 17, TCA arranged meetings with the leadership of the Congressional Turkey Caucus for two visiting Members of Turkey’s Grand National Assembly of the Republican People’s Party (CHP). The Honorable Ozturk Yilmaz, the CHP Vice-Chair, and Oguz Kaan Salici met with the four Caucus Co-Chairs, Congressmen Pete Sessions (R-TX/32nd), Steve Chabot (R-OH/1st), Gerry Connolly (D-VA/11th), and Steve Cohen (D-TN/9th). They also met with Congressman Don Bacon (R-NE/2nd) who recently joined the Caucus. During the meetings, both sides emphasized the importance of the bilateral relationship and their desire to continue working together. Discussion also focused on the upcoming referendum in Turkey, the fight against ISIS, the Syrian civil war and refugee problem, Turkey’s concern about the PYD in Syria, PKK terrorism, the Turkish American community and developments in the U.S.-Turkey relationship under the Trump Administration. The Congressional Caucus on U.S.-Turkey Relations and Turkish Americans reached 143 members with the addition of Rep. Jamie Raskin (D-MD/8th). Currently, the Turkey Caucus is represented in 43 out of the 50 states and five out of the six U.S. territories. The Turkey Caucus is a bi-partisan platform for members of Congress to focus on U.S.-Turkey relations and issues that concern Turkish Americans. TCA President G. Lincoln McCurdy traveled to Seattle, Monterey, and San Francisco to meet with Turkish Americans and discuss U.S.-Turkey relations and the importance of civic and political activism. He also participated in a meeting between members of the Turkish American Cultural Association of Washington (TACAWA) and Rep. Pramila Jayapal (D-WA/7th) in Seattle. On March 8th, representatives from the Turkish American, Syrian American, and Macedonian American communities participated in a joint meeting with Congressional Turkey Caucus and House Foreign Affairs Committee member Rep. Brendan Boyle (D-PA/13th) at TCA. The discussion focused on U.S. foreign policy towards Turkey, Macedonia, Syria, and the surrounding regions. On March 8th, TCA helped facilitate a video conference call between members of the Turkish American Cultural Society of Colorado (TACSCO) and Congressional Turkey Caucus and House Armed Services Committee member Rep. Mike Coffman (R-CO/6th) to discuss U.S.-Turkey relations, Turkey’s role in Syria, and other issues important to the Turkish American community in Colorado. Rep. Coffman participated in the video conference call from his office in Washington with TACSCO member Dr. Erdal Ozkan, whereas six members of TACSCO took part in the video call from the congressman’s district office in Aurora, Colorado. TCA President G. Lincoln McCurdy and TCA Project Coordinator Sezan McDaniel also took part in the call from the Washington office. TCA facilitated meetings on Capitol Hill for Dr. Muhammed Sahin, rector of MEF University in Istanbul, during his visit to Washington, DC to attend the American Council on Education’s (ACE) annual meeting. Dr. Sahin met with staff from the offices of Rep. Jared Polis (D-CO/2nd) and Rep. Virginia Foxx (R-NC/5th). TCA President G. Lincoln McCurdy visited the American Turkish Association of Washington DC’s (ATA-DC) Ataturk School in McLean, VA to give a presentation on civic and political activism to the parents of the Turkish American students. ATA-DC’s Ataturk School has offered Turkish language and culture classes to children for over thirty years.